Natalie traveled from Centralia, Washington to Long Lake, New York, to her summer home in the Adirondack Mountains like she had done every summer as far back as she could remember. Her family cabin, that had been passed down from her parents, was nestled in the evergreen trees only a few hundred feet from the crystal clear water of Lake Eaton. This had been her refuge since she was a young girl. A place for quiet reading, swimming, family game nights, and great conversations. Being that the only access to the camp was by boat it made for a secluded sanctuary for enjoying the wildlife of the beautiful area. 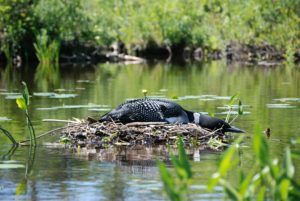 There were black bears, beavers, an occasional moose and an abundance of birds from waterfowl to pileated woodpeckers always searching for their next meal in the nearby decaying trees. After arriving, Natalie and her husband Yvon set to work preparing the camp after the unoccupied winter. They secured the three sections of the metal dock, placed the wooden Adirondack chairs in their favorite viewing spot and hooked the green and blue striped canvas hammock between the two birch trees. While Yvon was off to start the solar inverter and finish putting supplies away Natalie headed down to the water to set up the swim line. They enjoyed getting daily exercise while swimming along the line counting laps as they swam. She gathered her supplies; two empty gallon maple syrup containers (from her days living in Vermont), some heavy twine and 3 large rocks which she found on the shoreline. After securing the thick twine to the neck of the bottle and measuring out four feet of twine she secured the other end to one of the rocks. She dove down into the water placing the rock 50 feet from shore. Once she surfaced she was quite surprised to see two visitors. 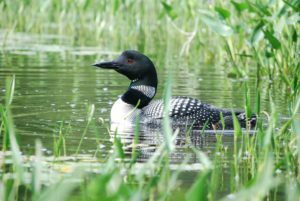 A pair of magnificent common loons just a few feet away. Though a few of these migratory birds visited the lake each summer they usually kept their distance from human visitors. Natalie admired the beautiful waterfowl with their striking red eyes, black heads, white striping collars, and precision spotted backs. She then went on her way to complete her task. She secured another line and dropped it 50 feet from her original spot. As she surfaced again she noticed they were still there admiring her diving abilities. One more dive to finish the task. As she rose one last time and looked around, they were nowhere to be seen. The next morning as the sun rose, while the pink hues were still visible in the sky and the last of the dense fog lifted from the lake Natalie went for her daily swim. Her visitors arrived to watch. They watched stroke after stroke, dive after dive until the last lap and then they were gone again. This continued for three days. On the next morning, she was surprised to see only one of the loons swim in through the lavender water hyacinths. He slowly glided through the calm water close to the shoreline. She knew they often traveled in pairs or small groups and was surprised to see only one. This continued through the next couple of sightings and she began to worry that perhaps something had happened to the mate. She had shared her concern with Yvon and he said he would keep his eye out when he went fishing that evening. Just after dusk Yvon returned and called to Natalie that he had a surprise for her. She quickly grabbed the life jackets, paddles, and binoculars. Skillfully climbing into the kayaks she followed Yvon out into the lake. They slowly glided around the bay past the tall pine tree with the large osprey nest, past the sunken trees and the abandoned beaver’s dam. As they approached the fragrant water lily covered bay they spied a small oval mound mostly hidden by slender green reeds and waxy leafed pickerel plants. Poised carefully on top of the mound was the loon’s mate. Just a few feet offshore she covered her precious gift with her body. Natalie and Yvon were cautious not to disturb her and just admired from afar. The nest was comprised of twigs, matted grasses, and even an occasional pine cone. There was no way of knowing how many eggs she was covering. They would just have to wait and see. As she paddled her way back to camp as the last bit of sunlight went over the mountains Natalie knew it was going to be a wonderful summer. This story is based on actual events from my vacation last summer on Lake Eaton. I took many photographs of these beautiful birds and will never forget the experience. Our family camp is next door to our wonderful neighbors who became the main characters for my story. I was immersed with your post this morning, transfixed by your descriptions. It sounds like a wonderful getaway. 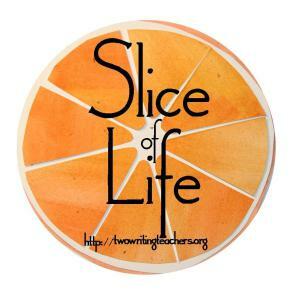 Thanks for sharing this Slice today! Descriptions were beautiful. The pictures were a nice addition.